In the nonprofit world, there has been an undeniable shift from print advertisements and in-person events to online marketing and tech-based donations. Nonprofits now rely more on a blend of technology and unique experiences to promote their causes and increase contributions. Because of this shift, many nonprofits have rethought the ways they engage with their best donors. How can they combine tech and “high touch” for the most impact? As a result, we see some creative changes in nonprofit events, especially at charity auctions. If you’re considering a charity auction as part of your next fundraising event, the following trends can help make it a hit even in a changing donor world. Using social media, making purchases, searching for information, and consuming media are all done on mobile devices. That’s why nonprofits focus so strongly on integrating technology into their events before, during, and after. By using the right apps, auction attendees can bid and share photos from a nonprofit’s auction, brush up on the organization’s mission, and check for event information on the go. Offering mobile bidding also allows auction guests to bid from their personal devices while socializing and participating in the event at the same time. That’s why, when nonprofits want more successful auctions they include mobile options. uBack. Process ticket sales and accept payments for silent auction items. Online Bidding. Bidders receive updates on their bids during the events, and other attendees can follow a package’s status without placing a bid themselves. OneCause. Mobile bidding, ticketing, RSVPs, paper auction templates, and raffles are all options with this tool. Text-to-Donate. Make an auction even simpler by instructing donors to text a keyword to a five-digit code. The following text message links to a secure donation form, making the whole process mobile. There are also plenty more online and in-person bidding tools for nonprofit auctions out there, so don’t be afraid to play around and see what works for you and your audience. The idea is to make an auction as simple and fun as possible. Many nonprofits do that by making the auction social. Even the most engaging event with the most exciting auction items will go nowhere if promotion fails. Social media can promote your organization, event, and auction at little to no cost. Because social media has some advantages over print advertising (cost-effectiveness, performance trackability, customization), it’s becoming a powerful tool for charity events. Promoting more on social media. Nonprofits may be stuck in the habit of promoting charity auctions in-person or through event invites. Why not include followers on social media? Let them know what the event is, where it’s taking place, and what they can expect. Make it visual and keep sharing. You’ll likely see an increase in ticket sales and attendees. Making it measurable. Ask your followers questions: How did you hear about our organization’s upcoming event? Are you planning on going to our next auction? What items would you like to see up for auction? Responses may represent a small segment of your audience, but it is still a useful snapshot of information and can lead to more guidance for future events. Keeping it going. Post your charity auction information, highlight items or companies who are sponsoring the event, and ask attendees to post a picture on social media, or share a video during the auction. Whatever type of social sharing is appropriate for your event, encourage it. Not only does this encourage non-attendees to get involved in the next event, but it gives you more “visibility” when attendees share hashtags or accounts. Social media is a great place to introduce the theme or format of your charity auction, as well, which is where your event can make a splash. Guests who frequently attend auctions know the drill and will expect your event to follow suit. Many nonprofits, however, now capitalize on this audience expectation and mix up the “traditional” format. By mixing it up, auction attendees get a change of scenery, and the novel experience may lead to more engagement and non-auction donations. Tweak the basic details. Small and straightforward differences can notch up the novelty of your charity auction. For example, move the auction to a day other than Friday or Saturday. You'll avoid competition for other significant events, increasing the number of attendees. You can also choose a nontraditional venue for the auction or create a unique theme for the event. Host the auction in a small airport hangar and create a travel theme or a retro 1940 or ‘50’s theme. Partner with a local museum to host your event and tie the museum pieces to a theme. Alternatively, throw an event that breaks the mold by asking attendees to dress down in casual wear or pajamas. Try different auction styles. When most people think of an auction, they think of an auctioneer talking a mile a minute and awarding an item to the highest bidder. However, auctions can take different forms, such as silent auctions or online auctions that accompany an event. You can also auction off non-traditional items, such as services or packages, or themed items (to go with your event). Use stories as part of the decor. Play videos about your nonprofit during an auction. Stories can be told with a video presentation or on visual loops throughout the event, making it accessible for all attendees. Show what your nonprofit does and why. 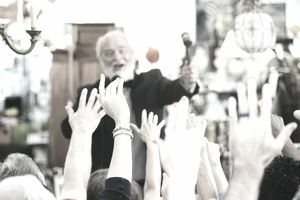 Using videos to tell stories creates a personal connection with your audience, and it makes an auction experience unforgettable. Keeping up with changing trends in nonprofit marketing can be tough and considering how to stay ahead of the curve can be stressful. However, we’ve seen that social media and mobile platforms are here to stay, so it’s essential to find ways to incorporate them into your events. Engaging donors and event attendees on social media, creating fresh auction formats and creatively using story during your auction are also great ways to make your events a hit. Consider how these trends fit into your next charity auction.